My FOTD's have been a little bit same-y lately. I've been using my Naked palette a lot. It was the easiest thing to keep out when I packed the majority of my makeup away for moving. I was ridiculously tired last week but still wanted to look fresh faced. I opted for light eyes and a lipstick I hadn't used for a while. First Light Cosmetics Blush - Mistral*. 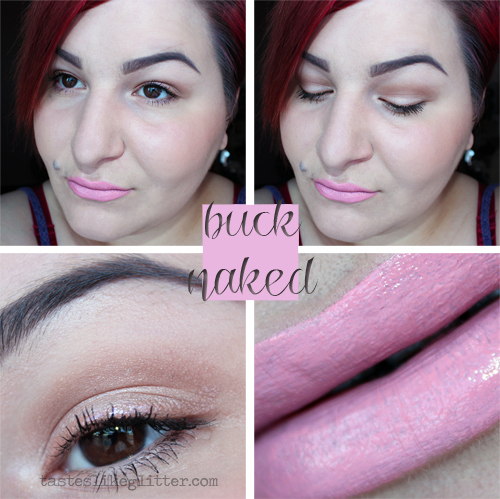 Urban Decay Eyeshadow - Virgin (brow/inner corner highlight), Sin (all over lid), Naked (crease), Buck (on top of Naked). Skipping liquid liner feels really weird to me. I don't feel my makeup looks finished if I don't use it. I opted for Illamasqua's Glister as it's very neutral and blended in with the look. Random thought of the day. Pink Lingerie is quite light in colouring and makes me feel like a cross between Barbie and Nicki Minaj when I wear it. A little bit of a plain look but I thought I'd post it anyway!